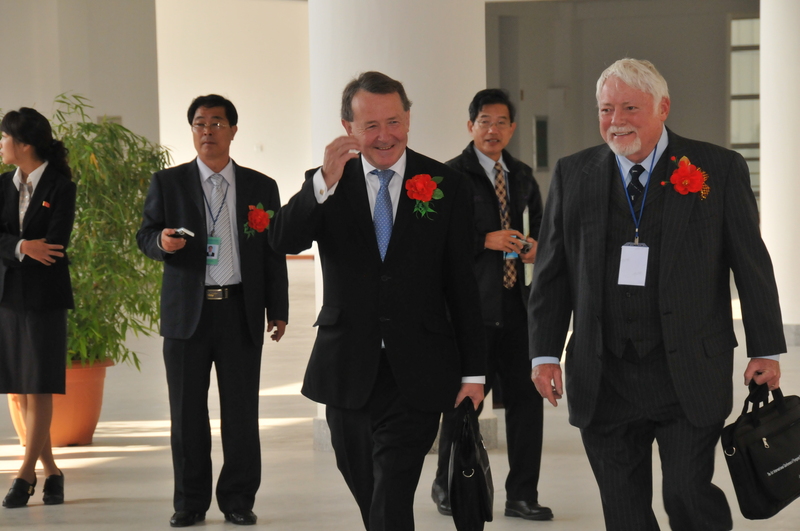 Text of an address to be given by by Professor Lord (David) Alton at Pyongyang University of Science and Technology, October 4th 2011. Let me begin by first thanking the President of Pyongyang University of Science and Technology, Dr. James Kim, for his invitation to speak to you. At the foundation of this important academic institution Dr.Kim said “I believe in the power of education” – and so do I. 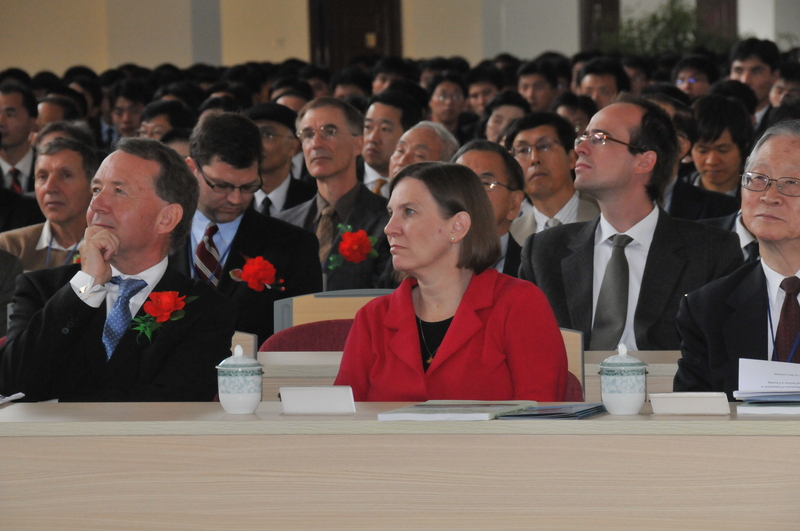 He said that the university is a gift to North Korea to help the country “to be efficient, effective and productive in modern society.” In working for prosperity for North Korea he said that “political and economic efforts alone do not result in peace and prosperity…education can, however, plant seeds of the values that are critical in reaching our desired end. These values include understanding; respect; sacrifice and reconciliation.” These are all objectives which I endorse and with which I agree. This is my fourth visit to North Korea. On my first visit I said that “it is better for men to build bridges than to build walls.” I remain committed to bridge building – always conscious that the construction of bridges requires genius and precision, engineering know how. Walls are much easier to build but unlike bridges, they separate; and, unlike bridges, walls divide. I hope that PUST will excel in producing a generation of leaders who will contribute to the peace and prosperity of this peninsula and to the wellbeing of the wonderful Korean people. May I also say how happy I am that our new British Ambassador, Karen Wolstenolme, who only arrived here last Friday, has been able to join us today. In welcoming her may I pay tribute to the outgoing Ambassador, Peter Hughes, and to the work of the British Council in promoting the English language – now North Korea’s second official language – and who have been a force for good over the ten years since Prime Minister Tony Blair created diplomatic relations. 1. The subject of the lecture. 2. An overview of the good and bad uses to which science can be put. 3. What questions do we need to ask to find the most ethical path? 4. What the future holds. One of the first great breakthroughs in technology was the discover of the wheel in Mesopotamia – present day Iraq – and Central Europe in 3500 BC. Five thousand years later Johannes Gutenberg invented the printing press – an instrument of mass production. Not long after, in 1698 AD, an Englishman, Thomas Savery, invented the steam engine; in the 1860s a Frenchman, Louis Pasteur used the microscope – which emerged in a crude form in the sixteenth century – to prove the existence of germs – enabling the identification of bacteria and the treatment of diseases; in the nineteenth century the harnessing of electricity allowed the phenomenal development of electrical lighting, new technologies and the telephone; the nineteenth century also saw the discovery of plastic – first exhibited at the Great exhibition in London in 1862 during the reign of England’s Queen Victoria. Closer to our own times, in 1944 the first personal computer was invented – 50 foot long and 8 foot tall – and computer technology is now incorporated into everything from microwaves to central heating; computer technology has led to the intranet and internet – an extraordinary tool for communication and education; the twentieth century saw the emergence of atomic energy – building on William Rontgen’s discovery of radiation in 1865. Some of the names we associate with the greatest scientific discoveries include Johannes Kepler (1571-1630), following in the footsteps of the father of modern astronomy, Copernicus, who promulgated his three laws which descried the orbit of the planets around the Sun; and Galileo Galilei (1564-1642) who invented the mechanical pendulum clock, improved the telescope, developed the first thermometer; and pioneered the study of modern science. Before travelling to Pyongyang, in Beijing I visited the tomb of Matteo Ricci and the other sixteenth and seventeenth century Jesuits who brought astronomical instruments and scientific knowledge to China. Eight of their instruments are exhibited at Beijing’s ancient observatory which I also visited last week. This was the first example of scientific diplomacy, about which we will hear more during the conference. During the seventeenth and eighteeth century Sir Isaac Newton (1643-1727) made revolutionary scientific advances, developing his three laws of motion; Charles Darwin (1809-1882), who developed theories on natural selection and evolution; James Clerk Maxwell (1831-1879) who made phenomenal breakthroughs in the study of electricity and magnetism; Albert Einstein (1879-1955) who created his theory of relativity, showing that gravity and acceleration are the same while Edwin Hubble (1889-1953) defined our place in the cosmos – with the orbiting space telescope named in his honour; while Paul Dirac (1902-1984) pioneered quantum mechanics. These are just a few names from an extraordinary roll call of great scientists who have made extraordinary discoveries. There have been many others – but suffice it to say that over the last century mankind has made huge scientific advances, and that these have had unquestionable benefits for civilisation. Yet with these great achievements have come new challenges that we must overcome if this progress is to continue. The promotion of a good scientific education is essential if the multitude of problems we face are to be conquered. Among these problems are the generation of safe, renewable energy (enough to satisfy the growing global demand), increasing our ability to feed ourselves and the promotion of medical advances to save lives and alleviate suffering. If we are to be successful, then in every generation we must ‘reach for the skies’, giving our young people a fine academic education and thereby enabling them to be at the cutting edge of scientific and technological innovation. In this lecture I will describe some of the most important breakthroughs in scientific and technological development, both recent and historical, and examine how these have demonstrably bettered the lot of humanity. However, I will also argue that good science must march hand-in-hand with a sense of good ethics. Education must enable young people, in particular, to reach beyond academic attainment. Young people must have the opportunity to think, enquire, debate and understand how decisions will affect their lives and the future of their nation. They need to have laid before them potential ethical dilemmas, moral conundrums, technological and scientific challenges, the rapidly changing pace of living – and world crises, ranging from hunger, to global warming, to the exploitation of finite resources. Education of the citizen must above all underline the moral significance of self-knowledge – as agents in the way we live and affect others. We need citizens who embrace the idea of individual moral responsibility for their actions. Unless we are able to conceive of ourselves as an agent or agents with regard to how we behave, it will be impossible to develop any sense of responsibility or judgement in the way in which we use science. Gaining that sense is important, for it is often the case that a new scientific discovery can be put to good, ethical uses that can improve our lives, but will also have more sinister, unethical applications that will cause harm. In other cases a technology may be clearly beneficial in principal, but must be deployed with care, lest unintended side effects end up doing more harm than good. This is why it is important that the next generation of scientists are given a good moral education, so that they can be mindful of and differentiate between the different applications of their work, and carefully consider the ethical implications of the discoveries they make. Let us consider then the ways in which science can be used and abused. Recently in China a certain manufacturer announced their intention to introduce a million industrial robots into their factory. A huge individual upgrade, this development made international news, but it is a symptom of a global trend that has been proceeding for decades; and it didn’t go down well with the workers in the factory. This technology is a good example of how science can be used to make life easier; by automating those essential but repetitive parts of the production process we can relieve workers from dull, menial tasks. In Haiti they have an old proverb – it’s a joke – that “If work were such a good thing the rich would have kept it all to themselves.” The point of the joke is that it’s no bad thing to get a machine to do a repetitive dreary job rather than making human being’s do it. But the story doesn’t end there. Discoveries have their consequences. In this case, it is leaving the workers without jobs, without income, without food and support for the families. Before upgrading all the factories everywhere we should be cautious and consider the implications of doing so; for if all the workers are replaced by machines, then first it is necessary to be sure that they will have other jobs to go to, or they will be forced into unemployment and destitution. In the last few decades, climate change has become a serious issue for the international community. The overwhelming scientific consensus is that the planet is changing in ways that will adversely affect lives everywhere, but particularly those in less well developed countries, such as the equatorial African states where droughts are set to increase in frequency – we need only consider the events of this year, where many lives have been lost in countries like Somalia and Ethiopia in the Horn of Africa – where I travelled last year – to understand the devastation this will cause – or the island nations of the Pacific, who could be swallowed up by the ocean entirely if sea levels rise as many scientists predict they will. Make no mistake, this is an issue that respects no borders and that all nations ignore at their peril. Climate change is an unfortunate side-effect of the industrial age, a product of our short-sightedness in seizing short term benefits at the expense of the future. But just as it arose from the products of scientific progress, so the answers will come from the scientific community. It is already happening. In the past, the sulphur dioxide that used to be released in bulk from European power stations caused acid rain – as the sulphuric acid that formed fell to earth again it caused great damage to the Scandinavian forests. In the 1980s I was a member of the British House of Commons and saw the situation firsthand in countries like Sweden and wrote a report on the environmental damage caused by acid rain. Another example are the Chlorofluorocarbons (CFCs) that were commonly used in refrigeration devices and which caused the protective ozone layer to become thinner, allowing more ultra-violet radiation from the sun to reach the earth. In Britain, London was once famous for its ‘pea-souper’ fogs, caused by the soot released from coal-fired power stations descending upon the city. The thick clouds of pollutants were the cause of many health problems at that time. Yet recognition of these problems, and the co-operation of governments in dealing with them, has led to a reversal of fortune in all these areas. The ‘hole’ in the ozone layer has been diminishing in size for years after new regulations were passed, controlling the use of CFCs. The acid rain and fogs are a thing of the past, thanks to the uptake of technology that extracts the soot and sulphurous fumes from the power stations before they are released into the air. In the same way, we can deal with the bigger problem that now faces us – the potentially catastrophic effects of releasing billions of tonnes of carbon dioxide into the atmosphere. Most climate scientists agree that if we do not cut down on these emissions, then many will soon pay the price. This is why so many people are working on new, clean methods of power production that will allow us to become independent from fossil fuels before their use can cause any more damage to the environment. Others are developing carbon-capture technologies that could slow down the change, buying us some valuable time. Nuclear power also has its part to play. It is well known that the technology has a dark side, in the form of appallingly destructive weapons. Many of you will know the story of Nagasaki and Hiroshima and the devastation caused in Japan by the dropping of the atomic bombs in August 1945 – and which led to the surrender of Japan and ended the Second World War – but with massive loss of life. We must also be wary of the problems caused by the difficulty of storing the radioactive waste products of nuclear fission, and of the potential for disasters such as this year’s reactor leak in Japan, and the disastrous meltdown of the Chernobyl reactor in 1986; Yet on the other hand, its use could allow us to cut carbon emissions now, in the expectation that cleaner technologies with no waste products, such as solar power, will in time be able to take over completely from the old. It is a technology symbolic of the struggle between the benevolent and malevolent uses of science. Against the backdrop of these long-term, global problems that science may hold the solutions to, are more immediate, pressing problems, which are just as important. I talked about drought and ensuing famine in Africa a moment ago, and at the beginning I said that our inability to feed everyone on the planet is one of the big problems humanity needs to solve; but again, if we use science wisely then this too may not be so intractable as it first appears. In North Korea itself, we can see how crop yields can be greatly increased by the introduction of irrigation systems, as was done in the paddy fields near Anju – and which I have seen for myself – with the assistance of an Irish group called ‘Concern’. These increased the annual rice yield by around 30 tonnes per year. Genetic Modification (GM) technology has allowed another group, World Vision, to grow virus and drought-resistant potatoes, which are now being grown here. The same crops are being used in other countries, such as Timor Leste and Mozambique to provide food security for people in those countries. The technology is clearly very useful. It is an extension of the modification farmers in all countries have practiced for centuries, done by selective breeding of crops with desirable traits, but it is more direct and a lot quicker. Scientists must be aware of its good potential, but also of the ways in which it could be abused. For example, one company tried to research ways in which crops could be made to become sterile after one harvest. This would ensure that the GM crops did not hybridise with unmodified strains, which could have unforeseen consequences, but the reason it was done was actually so that the company would be the only source of seeds, and so that farmers would have to buy from them each year. This is not helpful, it is just profiteering. The company eventually agreed to end its research into this area after coming under pressure. It would also be highly inadvisable to apply this technology to humans. Many have argued that doing so would cause serious social problems due to the blurred distinction between those with modifications and those without. Once modifications have been made, they cannot simply be removed again. Moreover, using of this kind of technology on people would seriously violate human dignity. Testing modifications inevitably leads to some failures and it is morally indefensible to subject human life to that risk. This brings me on to medicine. For many people this is the branch of science most relevant to their own lives. Because here too we are dealing with human lives, the scientists engaged in medical research must be particularly careful to consider the moral implications of their work. Although medical advances make our lives longer and more comfortable, the end does not justify the means; some experiments must be off-limits. Sometimes the immoral way is obvious. In the Second World War – in Adolf Hitler’s Germany – the German SS Officer Josef Mengele conducted so-called experiments on prisoners in the Auschwitz prison camp. These involved such horrors as unnecessary amputation of limbs, injecting chemicals into the eyes of children and surgery without anaesthesia. The absolute power he was given over the camp prisoners corrupted him, and although he claimed that he did these evil things in the name of science, it was clear to witnesses that he was not doing them for any reason other than to exercise his own power. It is a sobering thought that more than half of the participants at Hitler’s 1942 Wannsee Conference, which planned what was called “the final solution to the Jewish question” – that is the extermination and murder of Europe’s Jewish people – were either medical practitioners or in receipt of other academic doctorates. Nazi collaborators included a cast of scientists, doctors, judges, lawyers, philosophers and academics. It’s very easy to be corrupted. In other cases, scientists may feel that what they are doing will lead to a useful outcome – a new treatment, a better understanding of the disease. Yet this does not mean that all methods are acceptable. The seductive scientific argument that “if only” you would permit us to do this or that experiment we might make any number of useful discoveries gets dangerously close to a form of blackmail. It relies on the old canard that the end will justify the means; that unethical experiments may be used for seemigly ethical reasons. There is also an assumption that modern man is far too sophisticated and far too decent to fall into the sort of monstrosities characterised by Mengele and the Nazi scientists. Yet, history teaches us that vaingloriousness and hubris attended by vanity and conceit are often the trump cards when men seek to justify their unethical actions. Take the example of embtyology, cloning and stem cell technology. In Britain, since 1990 our scientists have destroyed or experimented on more than 3 million human embryos – and even created more than 100 animal-human hybrid embryos. One of the fastest growing fields in modern medicine is stem-cell research; finding a way to produce cells that are able to divide and grow into any type of human tissue. Among other benefits, this would allow doctors to grow replacement organs for their patients and repair damaged nerves. However, scientists said that the stem cells found in adults did not have this capacity – they are limited only to very specific types of tissues. Many therefore turned to the type of stem cells found in human embryos, which do have this capacity. However, others refused to do such work, believing, as I do, that experimenting on human embryos is morally unjustifiable, especially since the embryos are destroyed by the removal of their stem cells. Then, in 2006 a team led by the researcher Dr. Shinya Yamanaka discovered that they were able to modify the stem cells of adults to give them the ability to produce all tissue types, thus arriving at a solution to the problem involving no destruction of human embryos and side-stepping the moral issue. 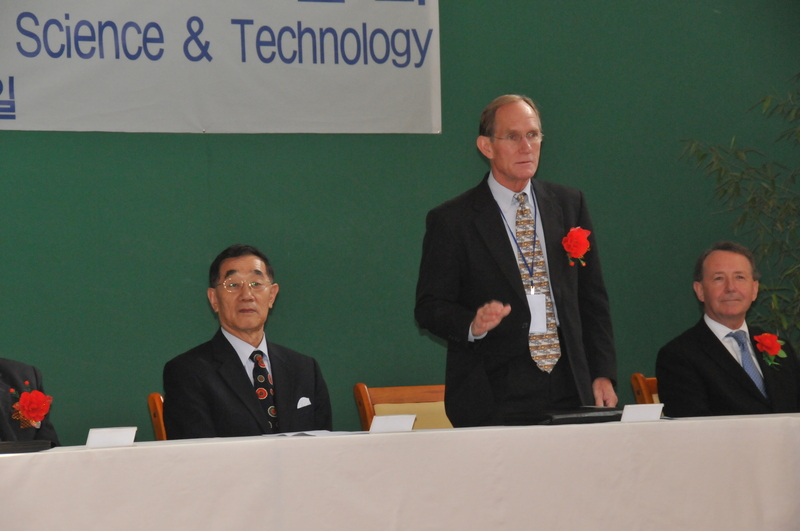 Thanks to professor Yamanaka good ethics and good science are now marching hand in hand. Worldwide, there are more than 80 treatments available now using adult stem cells. What are the cures using embryonic stem cells or animal-human hybrid stem cells? Not only is the destruction of human embryos an ethical morass it is a scientific blind alley, a cul-de-sac. Sometimes when there is no legislation preventing a certain line of research, scientists must decide for themselves whether the research is morally justifiable, or whether they should find another way. Science is as much about satisfying our own curiosity about the world as it is a source of beneficial technology, but not at any cost; a good ethical education is essential if scientists are to be able to see clearly and make sound judgements on the direction they take their work: that decision also determines the direction we steer our societies, and it is of paramount importance that the correct choice is made. Perhaps the biggest changes to the world in the last two decades have been brought about by the advancement of computer technology. Although computer networks were originally developed by the US military, they were later adopted by scientists doing civilian research, who recognised that the ability to share their resources and the results of experiments even across thousands of miles would be invaluable. In 1990 a British scientist called Tim Berners-Lee working at CERN, an international particle physics laboratory located in Switzerland revealed a technology that would allow networks all over the world to communicate – this led to the creation of the World Wide Web. Many of the technologies I have mentioned so far are only possible because of the huge scope for collaboration between scientists this allowed. Crucially, its inventors were not trying to make a profit, and wanted the web to be egalitarian, uncontrolled by any one group. Despite this, the technology has its dangers. The computerisation of banking and trading inevitably means we should prepare to have to deal with ‘cyber-crime’; criminals trying to use computers to steal. But it is becoming increasingly important in less-developed countries where the spread of computer technology is starting to improve standards of education, and its capacity to unite disparate people and nations is perhaps its greatest strength. It should be clear by now that while it is essential for scientists to think about the ethics of their work, it is not always straightforward to find the most ethical path. When they do recognise it, it is important to act. In the nineteenth century Alfred Nobel, a Swedish chemist, invented dynamite and gelignite, powerful but stable explosives, to be used for mining and engineering purposes. His intention was to make explosive mining safer and prevent accidents. Instead, his inventions were adapted for military purposes. This led to his unfair vilification, culminating in 1888 in his obituary in a French newspaper, mistakenly published after the death of his brother. The headline was ‘The merchant of death is dead’ and the article stated that he had ‘become rich by finding new ways to kill people faster than ever before’. Dismayed at this, Dr. Nobel changed his will, and when he died eight years after the publication of the original obituary it was found that he had left almost his entire fortune to the establishment of a series of prizes in recognition of outstanding advances in Physics, Chemistry, Medicine, Literature and Peace. The first were awarded a few years later, in 1901, and the Nobel prizes are now famous; they are Alfred Nobel’s legacy, and the thing he is most remembered for. He realised that despite his good intentions, his inventions had been used for unethical purposes, and so he dedicated his fortune to the advancement of ethical science – that is why although most of the prizes are for scientific endeavour, he also established a peace prize, awarded for contributions to world peace through the negotiation of peace treaties, reduction of standing militaries and development of closer ties between nations. One recipient of the latter prize was the Polish-born physicist Joseph Rotblat. I was privileged to meet him and to give the citation at my university in Liverpool, John Moores University, where I hold a professorial chair, when we conferred on him an honorary academic award. He might initially seem to you an unlikely recipient, for it was he who conducted the experiments in nuclear fission that demonstrated that it was possible to set up a chain reaction that would lead to a sustained release of energy. He calculated that this release of energy could occur in a fraction of a second, leading to a massive explosion. Before the Second World War broke out, he moved to the University of Liverpool, and so was not in Poland when Germany under the Nazis invaded. That his work could be used to manufacture a new, powerful type of bomb was not lost on him, and towards the end of the war, he joined the Manhattan project, believing that the Nazis were developing a nuclear bomb, and hoping to produce one first to act as a deterrent. Within a year it became clear that the Nazis had abandoned their project, and he left the project. He was the only scientist to leave the project on moral grounds before the production of the first bomb. When the atomic bombs were dropped on Hiroshima and Nagasaki in Japan, Rotblat was appalled at the use his work had been put to. He became a medical physicist and began to research the effects of radiation, and helped demonstrate the harmful effects of the fallout from the bombs. This helped lead to the Partial Nuclear Test Ban treaty, where many of the major nuclear powers of the time agreed to cease testing weapons above ground. He campaigned vigorously against the nuclear arms race for the rest of his life and was eventually awarded the Nobel peace prize for this. During his acceptance speech, he advocated the creation of an ethical code of conduct for scientists, of the kind he had adopted himself; an oath of moral responsibility for the consequences of their work; a vow to always act ethically. He concluded his speech with the words “Above all, remember your humanity.” – For it is in the moral principles common to all of us that the path to ethical science is to be found. So what questions do we need to ask as we scrutinise the world of science; what are the principles on which scientific work should be based and how do we instil a high concern for ethics into young scientists through education? I argued earlier that it is essential that citizens gain a sense of individual moral responsibility and accept the duties and obligations that come with the privilege of sharing in the common life of a nation or community. Educating for good citizenship is educating us to know ourselves. Beyond being told that stealing or lying is wrong, we also need to know what it is about them that makes them unacceptable. Rules must genuinely serve the development of judgement. If we were to educate for citizenship and ethics we would enshrine the duties of each person: to live peaceably; to participate in civic institutions and the processes of local and national government; to contribute to the resourcing of commonly beneficial institutions; to acquire knowledge and to encourage the pursuit of knowledge in children; to learn respect for the needs of others; to behave ethically; and to appreciate how legitimate rights have been acquired, and to cherish them. He teaches that such altruism can be accomplished only by those who have learned self-discipline. If such indispensable virtues – which united East and West – are not passed from generation to generation, civic fabric is bound to crumble. The virtues are acquired by practice. They are internal qualities perfecting the interior persona and, thus deeply affecting society as a whole. Education, and formation of the masses, must enrich the intellect, cultivate virtues and good tendencies, and engender a spontaneous uprightness of the will, and shape instincts and conscience. If it does not then technology and science will be used for purposes which threaten humanity. Good science and good ethics must be fellow travellers. If science is guided by these strong principles then it takes on real power to better the lot of humanity as a whole. What is more, by recognising that we are all working towards these goals, which means working for all, not just for oneself, we can foster lasting peace and prosperity with the nations of the world working together in scientific endeavour. What cannot be achieved by one alone can be achieved by many, and it is no surprise that many of the greatest projects being worked on today are international efforts. I want to talk about three in particular; and this brings me to my fourth point. Earlier I mentioned CERN, where the World Wide Web was created. I also said that it was a particle physics laboratory. A few years ago, the largest particle accelerator ever built was constructed underground. Known as the Large Hadron Collider, or LHC, this huge machine would not have been possible without the joint efforts of many countries – many, but by no means all in Europe, where CERN is situated. It is a hub of activity, with thousands of physicists working on the experiments made possible by the LHC, which collides atomic nuclei together at a speed almost equal to the speed of light and which replicates on a tiny scale the condition of the early universe. Through these experiments they hope to learn why the universe is as it is and answer some of the most fundamental questions about its nature. Similarly impossible without extensive co-operation between different nations is the International Space Station. Orbiting the earth at an altitude of over 350 km, it has had astronauts from many countries aboard it, and has been continuously occupied since 2000. If the human race is ever to go beyond Earth and its moon, perhaps to the planet Mars, then the experience of living for long periods in space will be essential when planning such a journey. The Russian, American, Canadian, Japanese and European space agencies have all been involved with it since the very beginning, and each has made their own contributions. It serves as a laboratory and observatory in space; more than that, it is a symbol of what is possible when scientists from all over the world work together. Since last year, the World Wide Web has been extended to include the space station, so the crew can access it at any time. These projects and advances are not isolated, but are all connected. For over half a century it has been the dream of many scientists to build power plants that operate by nuclear fusion, the same process that causes the sun to shine. Success would mean nuclear power without production of dangerous waste, and without the dangers posed by the disasters that conventional nuclear energy suffers from. I single this out as my final example because it has tremendous implications if it works; clean, cheap energy in abundance, enough to supply the whole world. It is also a highly international project, with experiments being conducted in China, Australia, Russia, Canada, Japan, India, the United States, Germany, Switzerland, Spain, the United Kingdom and many others. Alongside these programs conducted by individual nations is a large international program, ITER. Scientists from most of those countries and more are working together in France to build the most advanced experimental reactor yet, believing the final steps towards this important goal can only be achieved through international collaboration. Let me draw to an end. To conclude, science has the potential to cause problems for humanity, but also to bring us solutions. It has the power to harm, but also the power to help. It should always be at the service of humanity and work for the common good. The only way to ensure that the pursuit of science is in the interests of mankind is, through education, to instil a sense of moral responsibility and an understanding of ethics in the next generation, so that they can evaluate right and wrong for themselves and always look for the most ethical route. Every State takes its inspiration from the values of its citizens and these values of duty, respect, responsibility, reciprocity, and good stewardship of what has been entrusted to us must be passed from generation to generation. A high sense of ethics does not come about by itself. And how then does this affect the pursuit of science? Nothing in science – whether it be physics, cosmology, evolutionary biology or neuroscience – can lead to the conclusion that the universe is bereft of meaning or intelligence or that we can be other than guardians and custodians during our brief sojourn on our small part of this great creation. Einstein asserted that misuse of science could only be countered “by those who are thoroughly imbued with the aspiration toward truth and understanding. …I cannot conceive of a genuine scientist without that profound faith.” Manifestly, science operating in an ethical void carries huge risks for any society. The writer, H. G. Wells, understood what would happen if we fail to appreciate the role of education in fostering civilised society, where personal civic responsibility is cultivated in each person, insisting that “Maintaining civilisation is a constant race between education and catastrophe”. To avoid catastrophe, then, we must educate and always educate for virtue. You may be familiar with a proverb that says that if you want to plant for one season, plant a seed; if you want to plant for ten years, plant a tree; but if you want to plant for life, give a young man or woman an education. I passionately believe that. Education is about far more than memorising vocabulary or understanding quadratic equations. It is about the whole man, the whole woman. It must always be about more than reading from a text book. In English literature Charles Dickens immortalised the Victorian headmaster, Thomas Gradgrind, in his novel, Hard Times. As a teacher Gradgrind is obsessed with facts and the pursuit of materialism and he never sees education as being about values or about the deepening of a man’s mind. His is an emotionally cold world, devoid of love or encouragement; it is a world of numbers and memorised rote learning but not a world of humanity, compassion, or gentle intellectual inquiry. Gradgrind is ultimately a teacher of failure and in his personal life he is a father of failure – his son becoming a thief. Education must always be about far more than the memorising of facts. That is a belief which I know is part of the spirit and ethos of PUST. Roscoe Foundation for Citizenship, Liverpool John Moores University, 0151 231 3852 (fax: 0151 231 3853). 0207 219 3551 – House of Lords. To listen to a Roscoe Lecture: visit www.ljmu.ac.uk/citizen; then Roscoe Lectures; then multimedia.